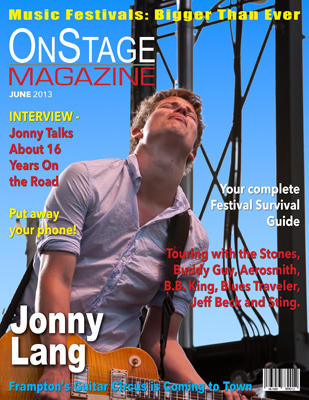 OnStage Magazine, and OnStageMagazine.com is a way for music fans to get the latest information on their favorite artists, and keep up with their new releases and concert tour coverage with stunning photographs and interviews, without waiting for a print version. We will strive to keep the site updated on a daily basis with the latest news. We also actively seek content from writers and photographers about any topic regarding music, as well as press releases from anyone involved in live music. Advertise with us: We have banner ads available for new artists, new releases or for anything you’d like to convey to our audience. Viewer statistics are available on request. All content Copyright 2012-2016. On Stage Magazine is a division of OnStage Media Group, LLC. Copyrights of YouTube video, or other media including recordings, interviews and photographic materials displayed on this site remain the property of their respective owners. OnStage Media Group, LLC, d/b/a OnStage Magazine and onstagemagazine.com, onstagemagazine.co.uk, and onstagemagazine.ca makes no claim whatsoever to the ownership of the intellectual property of those respective owners of content.